CHICAGO – In the latest HollywoodChicago.com Hookup: Film with our unique social giveaway technology, we have 25 pairs of advance-screening movie passes up for grabs to the highly anticipated “Machete Kills” starring Danny Trejo with director Robert Rodriguez in person for a post-screening Q&A! “Machete Kills,” which is rated “R” and opens on Oct. 11, 2013, also stars Sofía Vergara, Alexa Vega, Vanessa Hudgens, Mel Gibson, Jessica Alba, Lady Gaga, Charlie Sheen, Antonio Banderas, Cuba Gooding Jr., Amber Heard and Michelle Rodriguez from writer and director Robert Rodriguez and writer Kyle Ward. Note: You must be 17+ to win and attend this “R”-rated screening. To win your free “Machete Kills” passes courtesy of HollywoodChicago.com, just get interactive with our unique Hookup technology below. That’s it! This screening is on Monday, Oct. 7, 2013 at 7 p.m. in downtown Chicago. The more social actions you complete, the more points you score and the higher yours odds of winning! Completing these social actions only increases your odds of winning; this doesn’t intensify your competition or lower your odds! In “Machete Kills,” Danny Trejo returns as ex-Federale agent MACHETE. He is recruited by the president of the United States for a mission that would be impossible for any mortal man: he must take down a madman revolutionary and an eccentric billionaire arms dealer who has hatched a plan to spread war and anarchy across the planet. The movie poster for “Machete Kills” starring Danny Trejo from director Robert Rodriguez. This HollywoodChicago.com Hookup is simple! Just get interactive in our unique Hookup technology above. 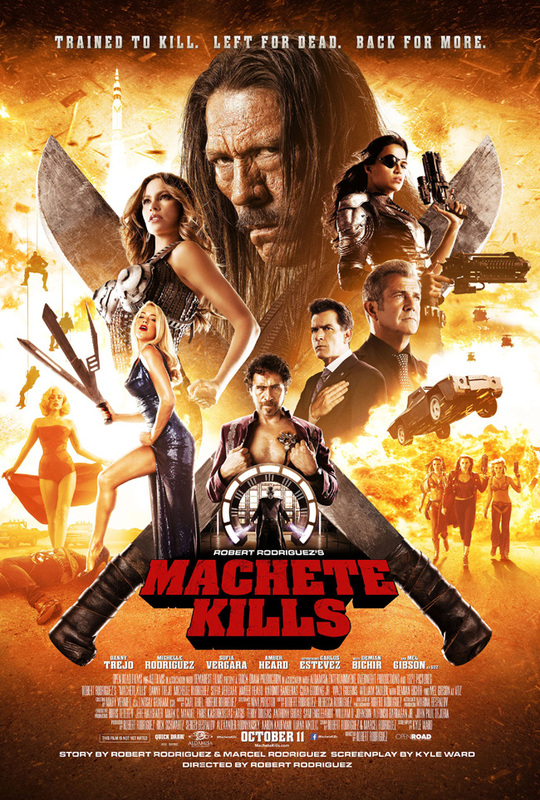 We will award 25 admit-two movie tickets based on social entry numbers and/or randomly via e-mail for our “Machete Kills” Hookup. Good luck!